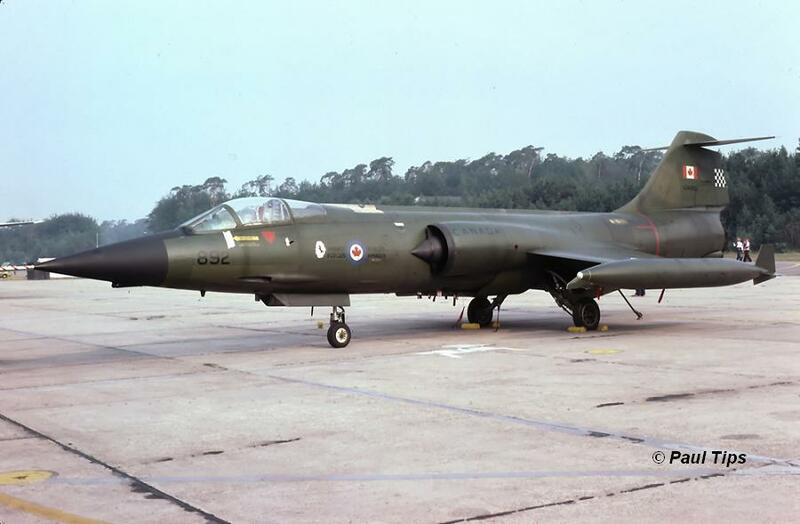 During this period some Royal Navy 809 Squadron Buccaneer S.2D aircraft from Honington were seen operating with MFG 1 at Schleswig Jagel, flying the F-104 Starfighter. This event looks like a one-way squadron exchange but we still need confirmation. It also could have been a deployment for a Naval exercise or something else. Who can confirm? 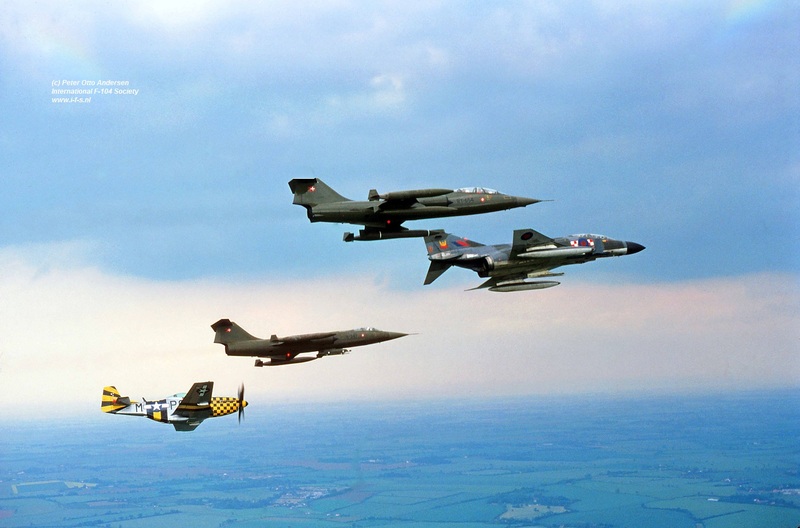 This month a squadron exchange took place between the Royal Air Force 29 Squadron, based at Coningsby, flying the F-4 Phantom and the Italian Air Force 9 Gruppo, based at Grosseto flying the F-104S. It is unknown if it was a 1 or 2 way exchange. At least the Italians flew to Coningsby. Aircraft at Coningsby were F-104S MM6702/4-12, MM6721/4-11, MM6770/4-4 and MM6869/4-3. 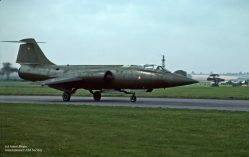 Aircraft F-104S MM6711/4-7 and TF-104G MM54251/20-15 arrived at Coningsby a month earlier on March 8th for a pre-visit and stayed the night. On the photos left MM6721 code 4-11 and right MM6869 code 4-3 both at Coningsby. This month a squadron exchange took place between the Royal Air Force 12 Squadron, based at Honington, flying the Buccaneer and the German Navy MFG2, based at Eggebek flying the F-104G. It was a 2 way exchange. 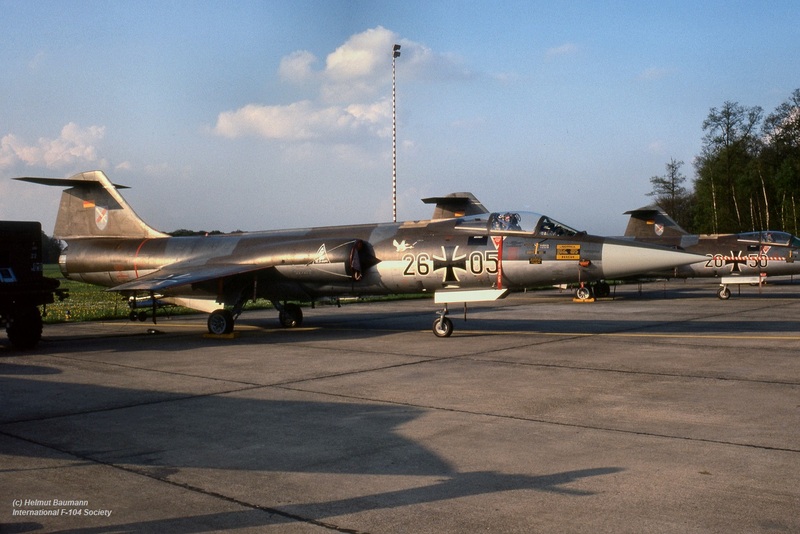 In total six Starfighters flew to the UK and also six Buccaneers were welcomed in Germany. 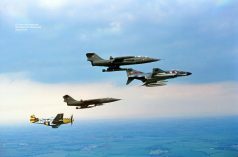 This month a shifted squadron exchange took place between the Canadian 439 Squadron, flying the CF-104 Starfighter at Baden-Sollingen and RAF 31 Squadron, based at Bruggen, Germany, flying the Jaguar GR.1. First the Canadian Starfighters flew to Bruggen from May 10th and from 31st of May till 9th of June the Jaguars visited Sollingen in return. 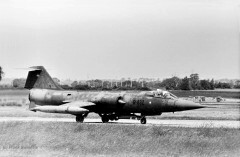 A pre-visit took place on April 14th when CF-104D 104658 landed at Bruggen. 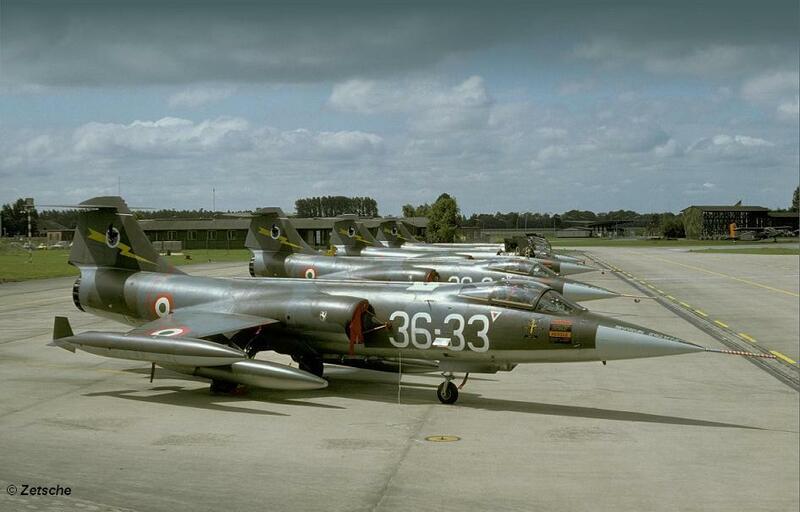 The Canadian part of the exchange started May 10th at 13:00h in the afternoon when a 8 ship formation arrived over Bruggen with aircraft 104713, 104716, 104733, 104776, 104826, 104830, 104838 and 104865. 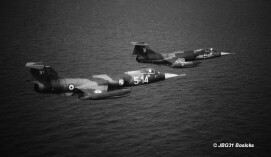 All carried 439 squadron markings except 104716 and 104830 (no markings). 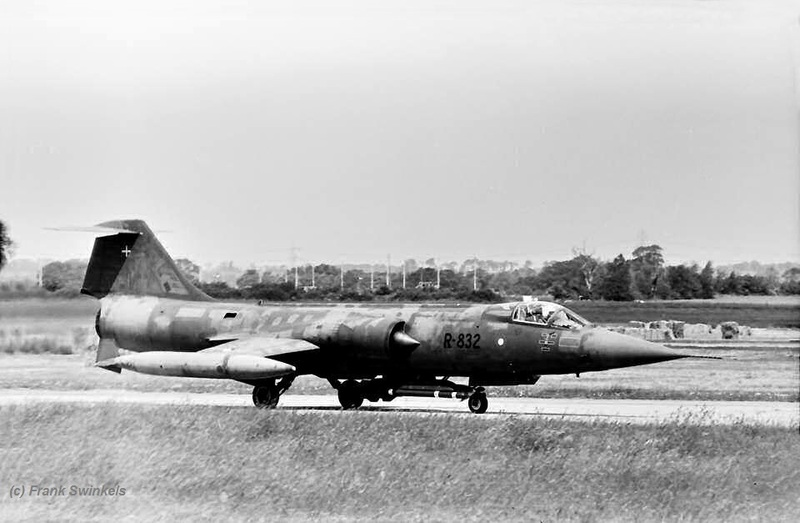 The next day CF-104 104751 (no markings) and CF-104D 104658 (439 squadron markings) arrived to exchange the aircraft 104830 and 104865, both flying back to Sollingen. On May 12th two more aircraft left being 104713 and 104838. On May 16th CF-104 104865 arrived back at Bruggen (after leaving May 11th). On the final day of the exchange in total 7 aircraft flew back to Sollingen being 104716, 104733, 104751, 104776, 104826, 104865 and 104658. During the exchange two CT-133 were seen performing crew-ferries being 133393 and 133542. (Information thanks to Hans-Juergen Breuer). 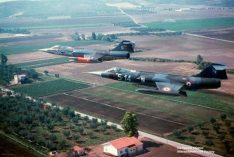 This month a squadron exchange took place between the Italian Air Force 132 Gruppo (part of 3 Aerobrigata), based at Villafranca, flying the F-104G and the USAFE 17 TRS/26 TRW based at Zweibrucken, equipped with the RF-4C. It was a two way exchange. 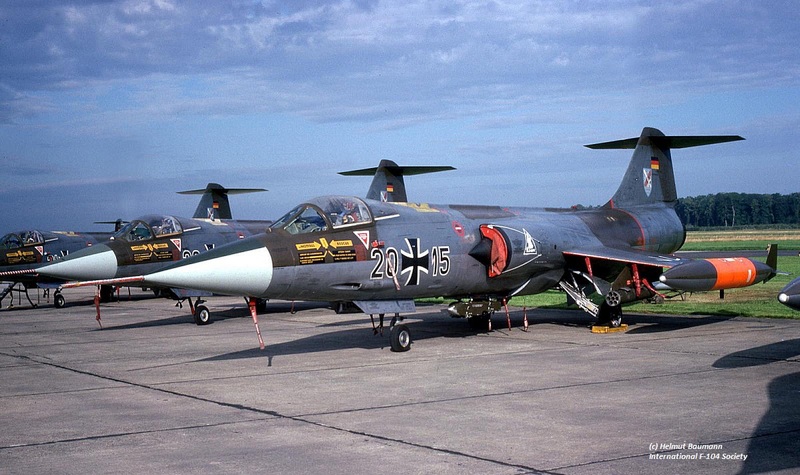 This period a squadron exchange took place between the Belgium Air Force 31 Smaldeel of 10 Wing, based at Kleine Brogel, flying the F-104G and the German Navy MFG1, based at Schleswig-Jagel flying the F-104G as well. 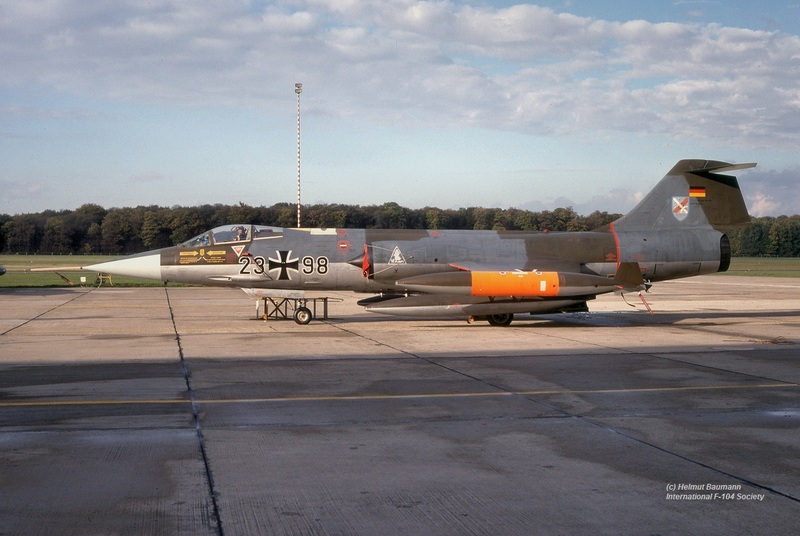 Six Belgium Starfighters flew to Northern Germany including FX60 and FX84. (some reports mentioned also FX94 but this was not yet confirmed). 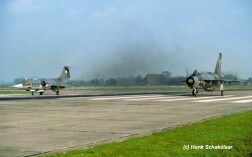 Most probably it was a 2 way shifted exchange with MFG1 to fly to Kleine Brogel later in the year! This month a squadron exchange took place between the Dutch Air Force 312 Squadron, based at Volkel, flying the F-104G and the Danish Air Force 725 Esk, based at Karup, flying the Saab A 35 XD Draken. It was a 2 way exchange. 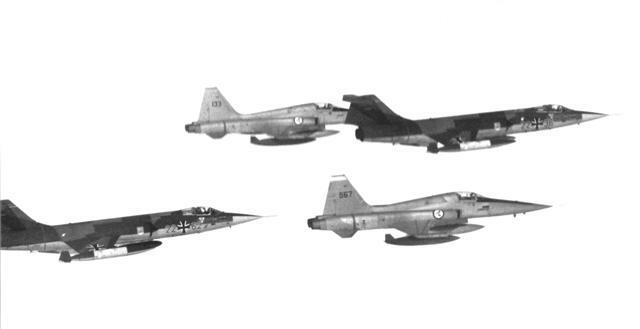 In total nine different Draken aircraft participated but not all at the same time. 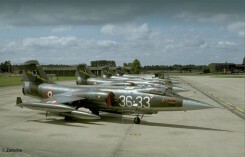 On June 20th and 21st a number of aircraft were replaced. 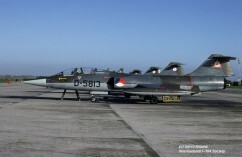 Five Dutch F-104G Starfighters flew to Denmark being D-6683, D-6697, D-8063, D-8268 and D-8312. 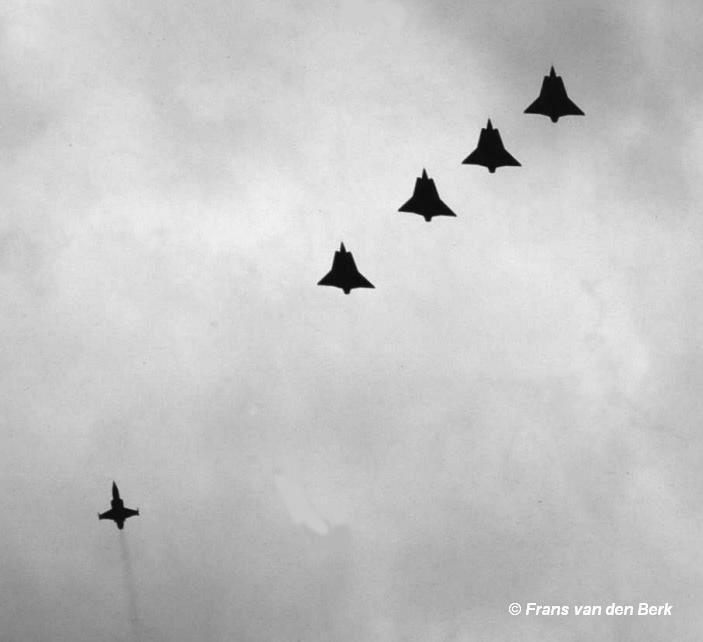 The photo shows the Saab Draken fighters over Volkel Air Base taken by Frans van den Berk. 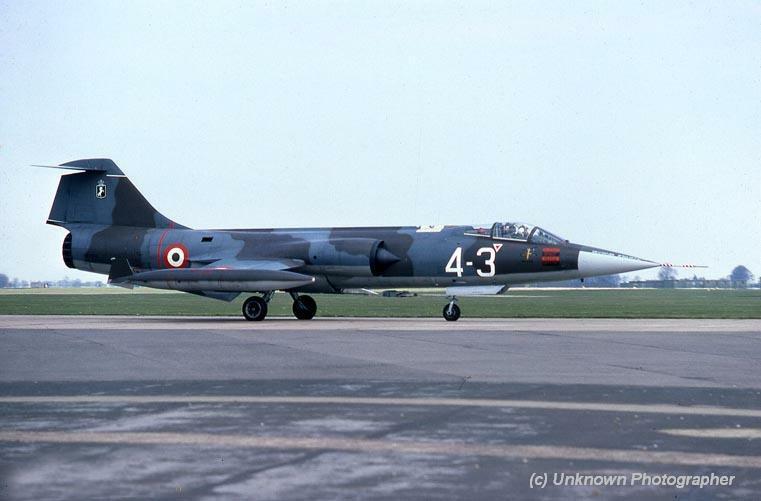 This period the Royal Danish Air Force 723 Esk based at Aalborg, flying the F-104G, exchanged with RAF 56 Squadron flying the F-4M Phantom based at Wattisham. It was a two-way exchange. 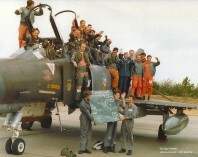 Five Starfighters (RT-654, R-347, R-341, R-832 and R-888) arrived in the UK the 20th, and four Phantoms flew to Denmark. Beneath photos taken by Frank Swinkels at Wethersfield during the exchange. Also a very nice colorphoto taken by Peter Otto Andersen, one of the participating Danish pilots in the UK. 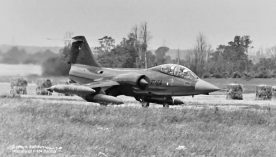 The aircraft flew from Wethersfield (an USAF auxilary airfield just east of Standsted airport, due to runway construction at Wattisham. 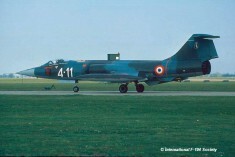 This period there was a squadron exchange between the Belgium Air Force 23 Smaldeel (10 Wing), operating the F-104G from Kleine Brogel and the French Air Force EC 2/4 ‘La Fayette’ operating the Mirage IIIE from Luxeuil. It was a 2-way exchange. This period a squadron exchange took place between the German Air Force JBG31 (2nd Staffel), based at Norvenich, flying the F-104G and the Italian Air Force 102 Gruppo, based at Rimini flying the F-104S. It was a shifted 2 way exchange. This first period the Italians came to Norvenich. Some believe it ended on August 8th, but the 4th of August is confirmed. 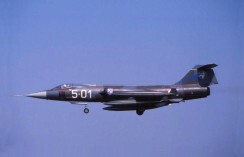 Aircraft “5-14” (very likely MM6842), MM6750/5-01, MM6781/5-13 and MM6846/5-16 were noticed. All Italian aircraft got JBG31 badges on its inlets as souvenir as can be seen on the photo beneath. Later in August the Germans flew to Rimini as can be read further beneath. This period a squadron exchange took place between the German Air Force JBG31 (2nd Staffel), based at Norvenich, flying the F-104G and the Italian Air Force 102 Gruppo, based at Rimini flying the F-104S. It was a shifted 2 way exchange. 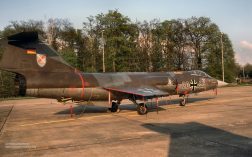 After the Italians visited Norvenich in July till early August, later in August the Starfighters from Norvenich flew to Rimini. 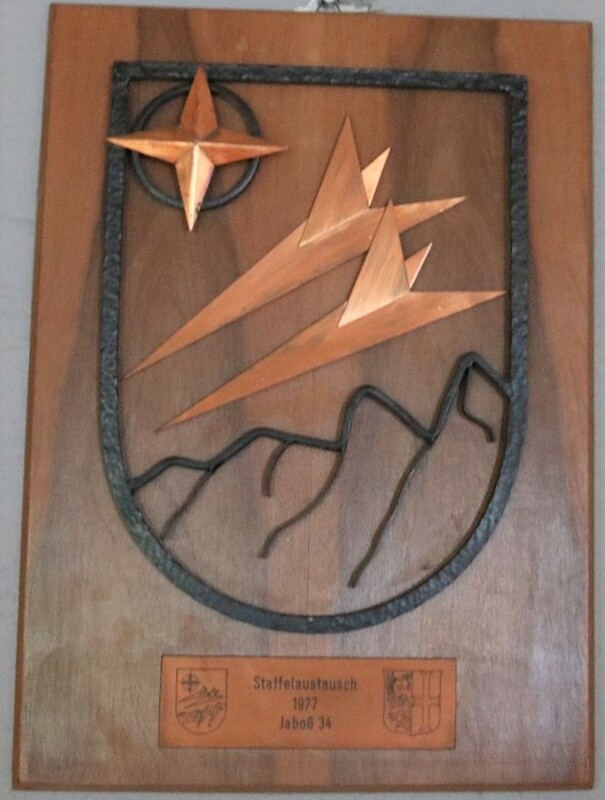 During the stay in Italy the German Starfighters received 102 Gruppo badges on their intakes. Aircraft involved were 20+15, 20+44, 23+98, 26+05 and 28+31. (See photos beneath) Photo 1: JBG31 guys at Rimini. Here they are standing and sitting on F-104S MM6846 code 5-16 which had been in Norvenich some weeks earlier and has JBG31 badge on its inlet... Photo 2: Nice flightline at Rimini. 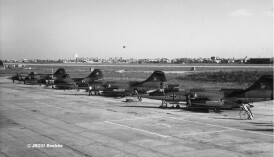 Aircraft seen are from right to left German 20+15 and 26+05, then Italian brand new MM6916 code 5-20 and the MM6846 code 5-16 (note the JBG31 badge on inlet. Photo 3: Italian MM6842 code 5-14 flying formation with German 20+15 over the sea near Rimini. Note the JBG31 badge on the inlets... The other photos show the F-104Gs 20+15, 20+44, 23+98 and 26+05 when back at Norvenich, clearly showing the 102 Gruppo badge on the inlet. (Photos thanks to Helmut Baumann). Also a nice photo taken over the Italian landscape showing MM6842 with 20+15, but in this case you can clearly see the JBG31 badge applied on the left intake of the Italian Starighter, on the other side it was clean. (Photo thanks to Patrizia Filippini. This year a squadron exchange took place between the Dutch Air Force 306 Squadron, based at Volkel, flying the RF-104G and the USAFE 1 TRS/10 TRW, based at Alconbury, UK flying the RF-4C Phantom. 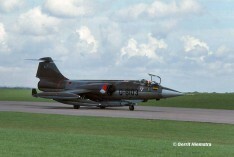 It was a 2 way exchange where eight different RF-4C aircraft came to Volkel, one replacing the other. Dutch Starfighters which flew to the UK were RF-104G D-8013, D-8103, D-8127, D-8145. Photo (taken by Gerrit Hiemstra) shows aircraft D-8103 taxying on the Alconbury runway during the exchange. The other photo (D-8145) was taken by E. Lang. 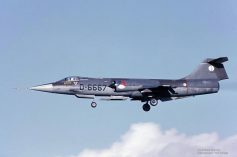 This month a squadron exchange took place between the Dutch Air Force 323 Squadron, based at Leeuwarden, flying the F-104G and the German Air Force JG74, based at Neuburg, flying the F-4F Phantom. It was a 2 way exchange. 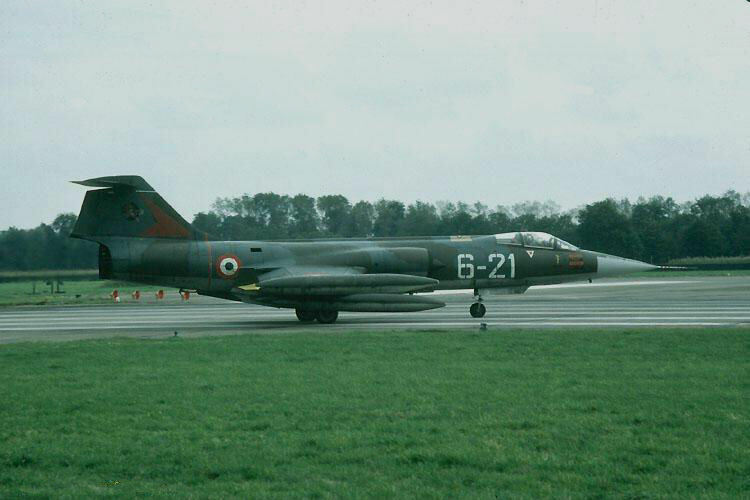 Four F-4F Phantoms flew to Holland and six Starfighters flew to Neuburg. Among them were D-6655, D-6667 and D-8115. The D-6667 received JG74 badges on the speedbrakes, seen later in Leeuwarden. 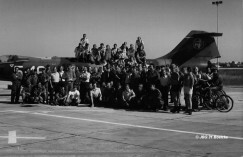 Transport was arranged by the Dutch Air Force (via three F-27 Troopships) from the start and at the end the Luftwaffe arranged the transport back with two C-160 Transalls. Beneath two photos provided by 323 Squadron pilot Guy Putker showing the arrival of the aircraft and the goodbye ceremony after the exchange had ended at Leeuwarden. Third photo shows the JG74 badge on the speedbrake of D-6667, taken by Andries Warring. 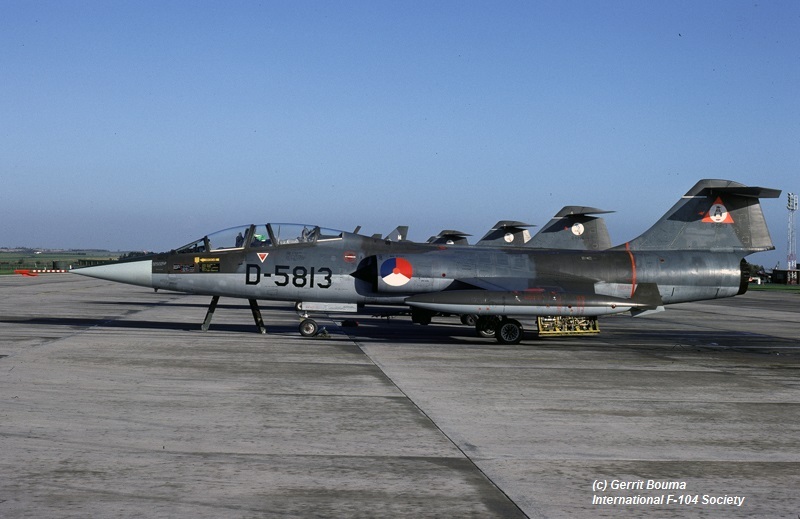 This period a squadron exchange took place between the Dutch Air Force 311 Squadron, based at Volkel, flying the F-104G and the Italian Air Force 154 Gruppo, based at Ghedi flying the F-104G. It was a 2 way exchange. The Starfighters which flew to Volkel were MM6510/6-01, MM6577/6-06, MM6542/6-11 and MM6553/6-21. Beneath photos of all the participating Italian Starfighters. Code 6-06 was photographed by Paul van Oers. 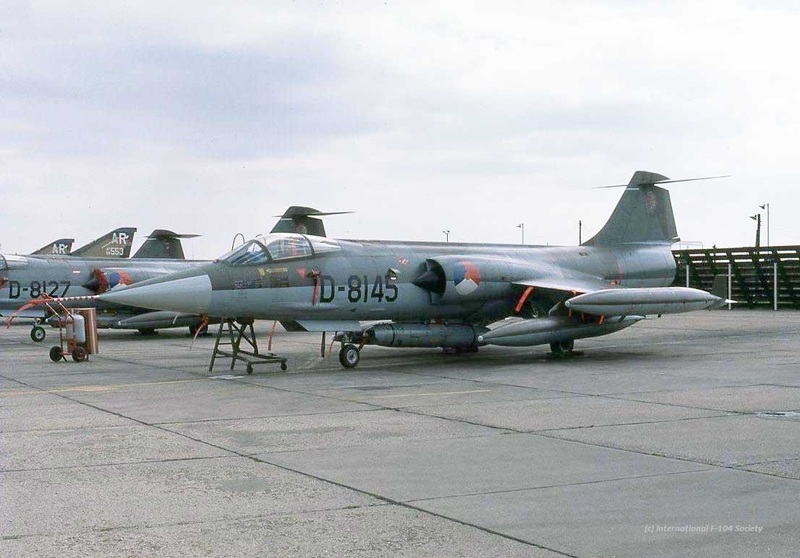 This period a split squadron exchange took place between the Royal Air Force 15 Squadron, based at Laarbruch, flying the Buccaneer and the German Navy MFG2, based at Eggebek flying the (R)F-104G. 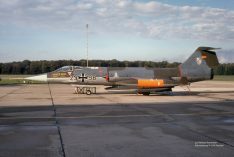 The first period (Sept-Oct) the Germans flew with six RF-104G Starfighters to Laarbruch while later from 17 till 27th October the English aircraft flew to Eggebek in return. This month a squadron exchange took place between the Norwegian Air Force 331 Skv, based at Bodo, flying the F-104G and the USAFE 526 TFS/86 TFW, based at Ramstein, flying the F-4E Phantom. It was a 2 way exchange. 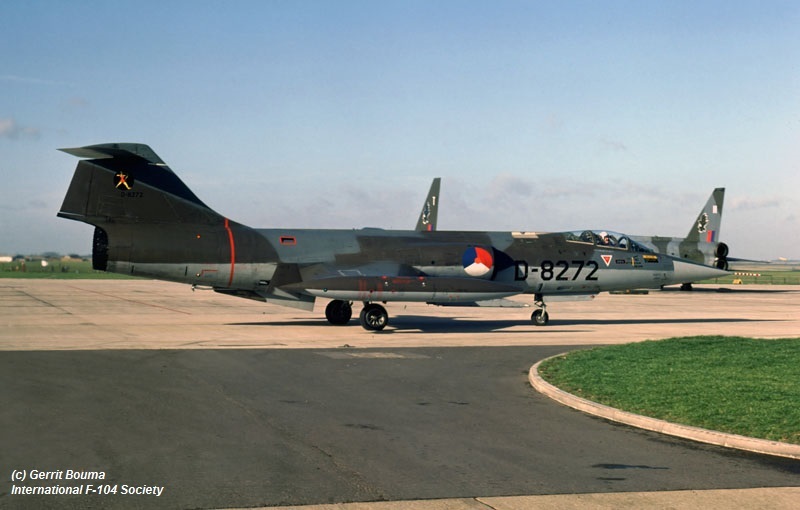 This month a squadron exchange took place between the Dutch Air Force 322 Squadron, based at Leeuwarden, flying the F-104G and the Royal Air Force 11 Squadron, based at Binbrook bringing three Lightning F.3 and one Lightning T.5 aircraft. It was a 2 way exchange. During this event a soccer game was organized at Leeuwarden where the 322 Squadron team beat the team from Binbrook. However in Binbrook also a soccer match was organized where the British won!! 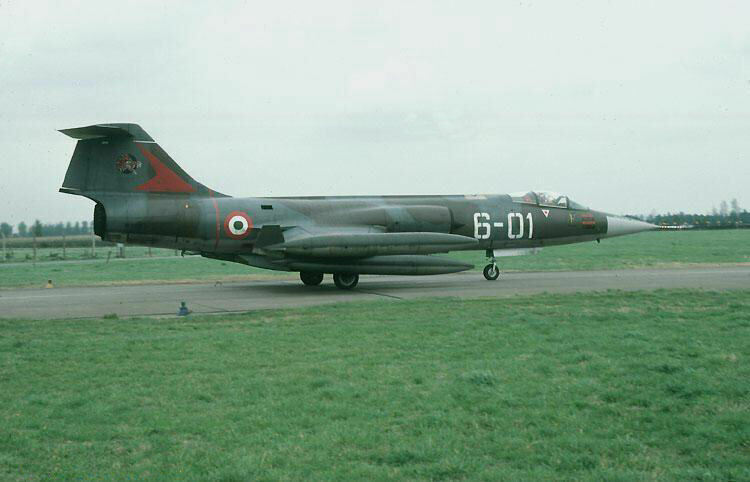 In total 322 Squadron flew to Binbrook with 6 Starfighters being D-5813, D-6653, D-6657, D-8272, D-8286 and D-8297. 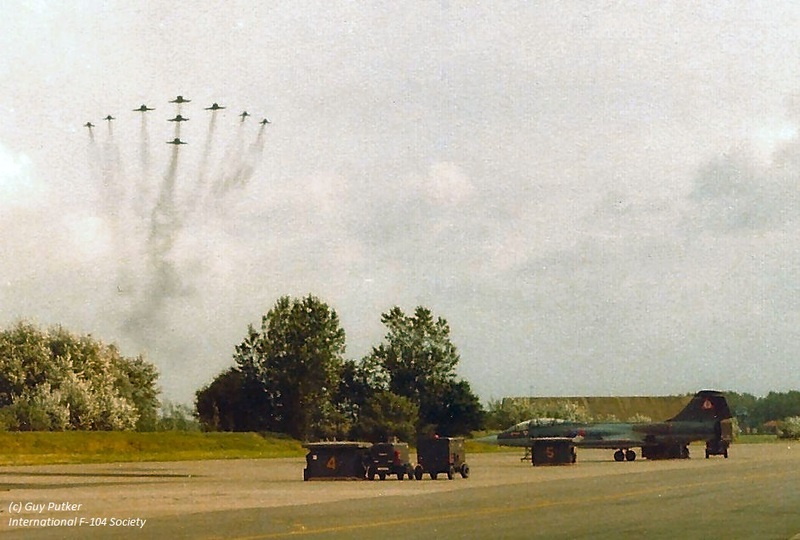 During arrival they planned to make a fly pass from the North but due to a navigation error the formation flew 3 miles South of the Airbase approaching it from the other side. The Lightnings made a fly-pass during their departure from Leeuwarden. Four aircraft flew very low “through” the trees opposite the 322 Squadron building. Later on they heard that this had been a mistake. Number 4 didn’t hear that he had to fly out of his box-position. The leader expected to be able to fly low along the squadron building while number 4 was still thinking “Stick to your leader!!”…. Gladly nothing serious happened but it was an impressive fly-pass!! 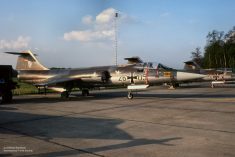 Photos beneath shows F-104G D-8341 ready for takeoff with guest pilot in Lightning from 11 Squadron at the runway of Leeuwarden. 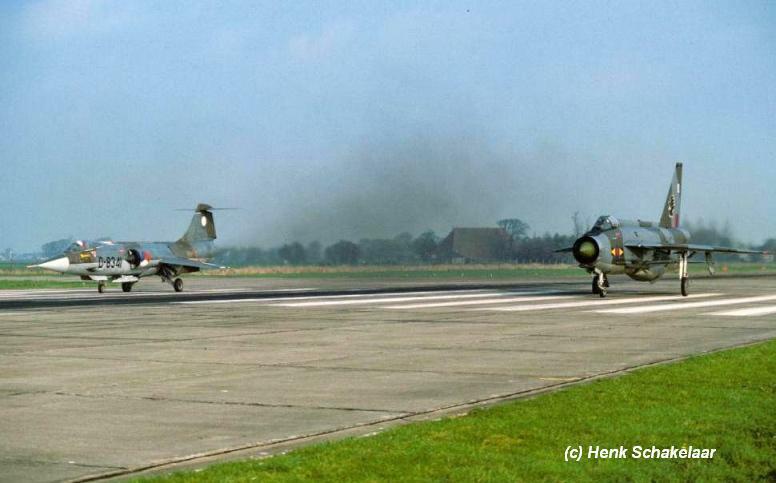 (Photo: Henk Schakelaar) and both TF-104G D-5813 and D-8272 were taken at Binbrook during the exchange by Gerrit Bouma. This month a squadron exchange took place between the Norwegian Air Force 334 Skv, based at Bodo, flying the CF-104 and the German Navy MFG1, based at Schleswig Jagel flying the F-104G. 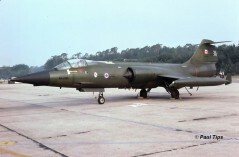 It was a 1 way exchange where four CF-104 aircraft flew to Germany only. 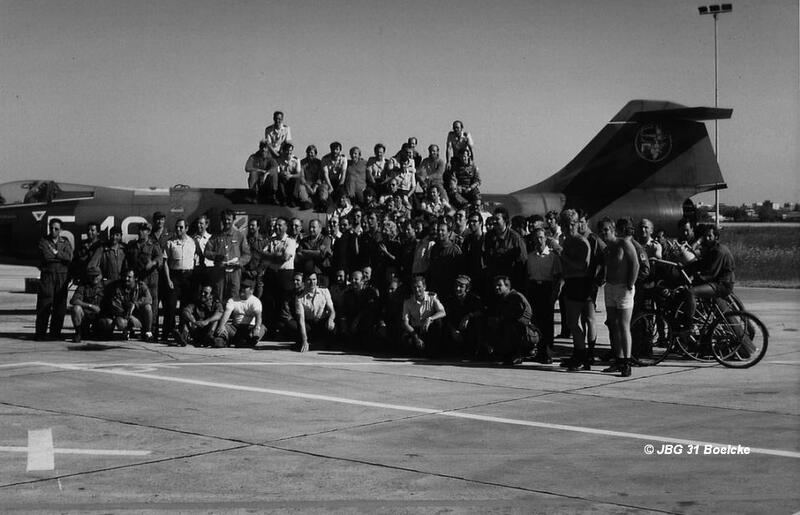 This month a squadron exchange took place between the Italian Air Force 23 Gruppo, based at Rimini, flying the F-104S and the Royal Air Force 5 Squadron, based at Binbrook flying the Lightning. It is unknown if it was a 1 or 2 way exchange. 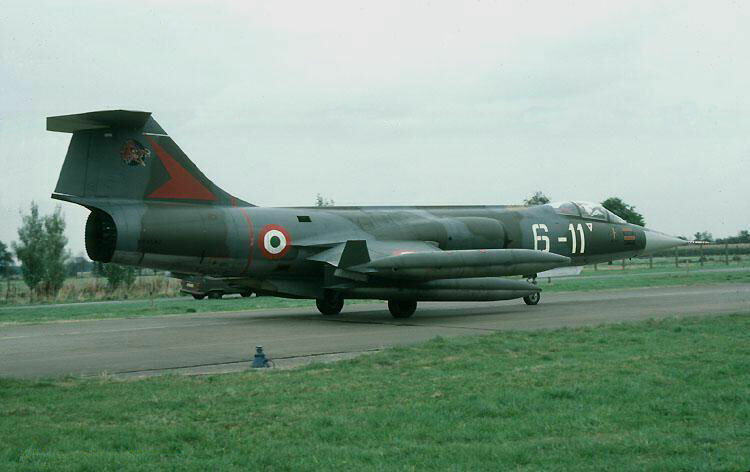 However the Italians flew to the UK where MM6827/5-30 and MM6822/5-34 arrived at Binbrook on November 7th and MM6873/5-35 and MM6922/5-36 landed a day later. 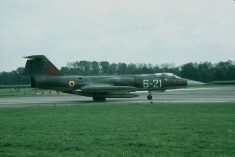 The Belgium Air Force 1 Wing - 349 Squadron operating the F-104G at Beauvechain exchanged this period with the RAF 2 Squadron, operating the Jaguar GR.1 at Laarbruch. It is unknown if it was a 1 or 2 way exchange. This year a squadron exchange took place between the Canadian Air Force 441 Squadron, based at Baden-Sollingen, flying the CF-104 and the Italian Air Force 10 Gruppo, based at Grazzanise, flying the F-104S. 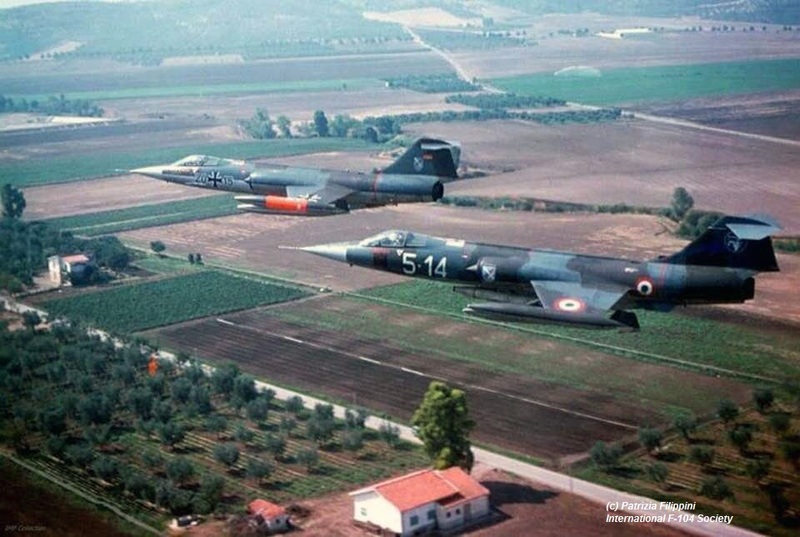 It is unknown if it was a 1 or 2 way exchange but at least the Canadian CF-104s flew to Grazzanise. One of the aircraft seen at Grazzanise was 104761. 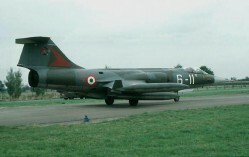 Among the aircraft seen at Grazzanise were 104761 and 104892. At least aircraft 104892 was zapped with a small horse insigne. 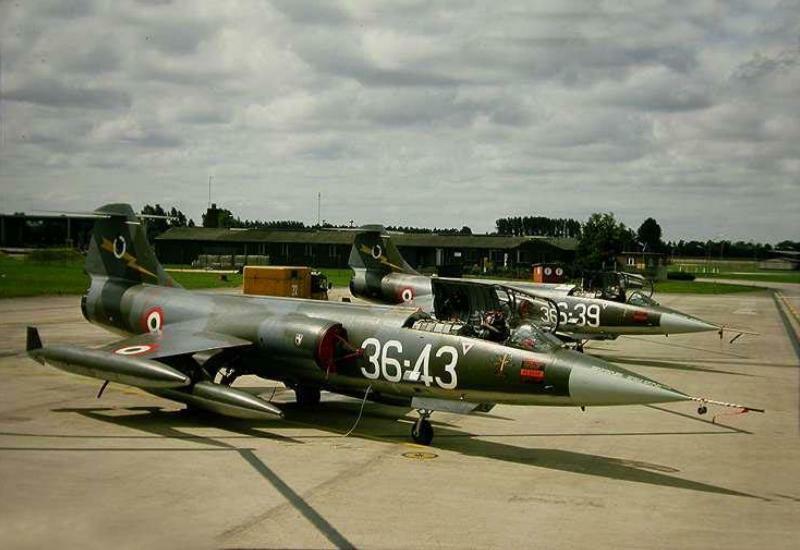 The left photo was found by Roger Seroo within the 441 Squadron books and shows 104761 taxying in front of the main 9 Stormo hangar. The other photo was taken in 1978 by Paul Tips at Ramstein and shows clearly the 10 Gruppo insigne zapped on the fuselage added in Grazzanise.